Politico: Ben Smith: Confederate battle flag, Obama yard sign | Stop Dog Whistle Racism! 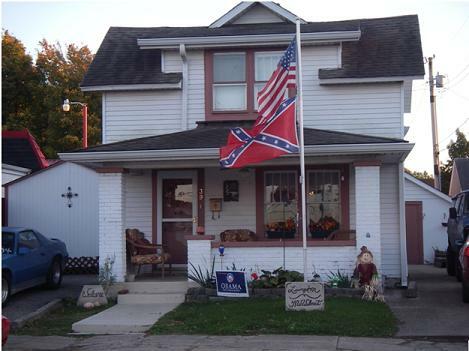 A house in Martinsville, Indiana, via my colleague Marty Kady. Another reminder of how complicated this race stuff is. everyone needs to stop making a big deal about this. just because we’re not in the south dosent mean we cant hate niggers. thats why i love martinsville you can hate em and have a rebel flag and ppl dont freak out, unlike the ones from other places who see this. this isnt uncommon in our town. and im thinkin the obama sign is a joke, i mean look at all the “change” he has done for the country NOT! Ok first off i live in martinsville indiana and im the least racist person you will ever meet i show as much love as i can to everyone i can. Because thats how my lord and savior Jesus Christ wants me do act. And i do agree that martinsville has some very prejudice ppl but most are not. My friends and i arent the slightest bit racist or ignorant it just that group of ppl and its ridiculous because we need to spread love to each other as much as possible and give glory to god for everything good that comes from it. These ppl are just mis guided and alot were raised that way martinsville not the most diverse place and i think its sad and ridiculous that ppl act this way and the gentle above me is obviously lost and doesnt know jesus or he would be on the other side of the fench and im not saying that blacks are better than us were all equal in the eyes of the lord. and the sooner we realize that the better we will be.